March – the month of Spring flowers at Happy Haute Home. Do you see a theme going here…a heavy focus on indoor cut flowers. As I work to hone my flower arranging skills, I am passing everything I learn onto my followers…so make sure to subscribe. So far, my focus has been on arranging cut flowers in foam, but today I will show you how to free style an arrangement in a vase. Personally, I prefer free styling flowers in a vase, it gives more of a natural appearance to the bouquet. But there are plenty of benefits to using foam, mainly in achieving a very uniformed and symmetrical centerpiece. After filling the container with fresh water, I used 7 pieces of fern to cuff the vase. The fern creates a base and provides support for the rest of the flowers. Make sure that all leaves that could fall below the water line are removed prior to putting in vase. You never want any leaves submerged in water. Use thorn strippers to remove thorns from the stem of the Shimmer Roses and cut them at an angle under water. Also remove any outer petals that don’t look good and insert the roses into the vase in a triangular pattern. This type of flower commonly requires floral wire to properly position the head and keep it from drooping. To insert the wire, poke a small hole in the underside of the flower at the base and twist the wire around the stem. Insert them into the vase in a triangular pattern. I used 3 tall Peach Stock Stems and inserted them in the middle of the vase. This creates balance within the centerpiece. Sometimes when you buy carnations at the store, they have a closed up appearance. Using the palm of your hand, you can gently fluff them and open up the petals making them appear wider. It makes a big difference in the way they look in the centerpiece. Use the carnations to fill in the gaps within your arrangement. The type of carnation I used is called Peach Lege Marrone Sole. These flowers are beautiful! I love the look of Lisianthus in a vase, the white petals are so delicate and feminine. I added 3 stems to my vase at different heights, then separated and added clusters of mini Wax Flower which look so pretty. There are so many varieties of eucalyptus out there, but for this arrangement I used Willow Eucalyptus, it has large heavy seeds causing it to droop nicely over the rim of a vase. I separated the pieces and used them in random areas around the base. Lastly, I added 1 piece of variegated pittosporum. To top it off, I made a 5 loop bow and tied it around the glass vase. 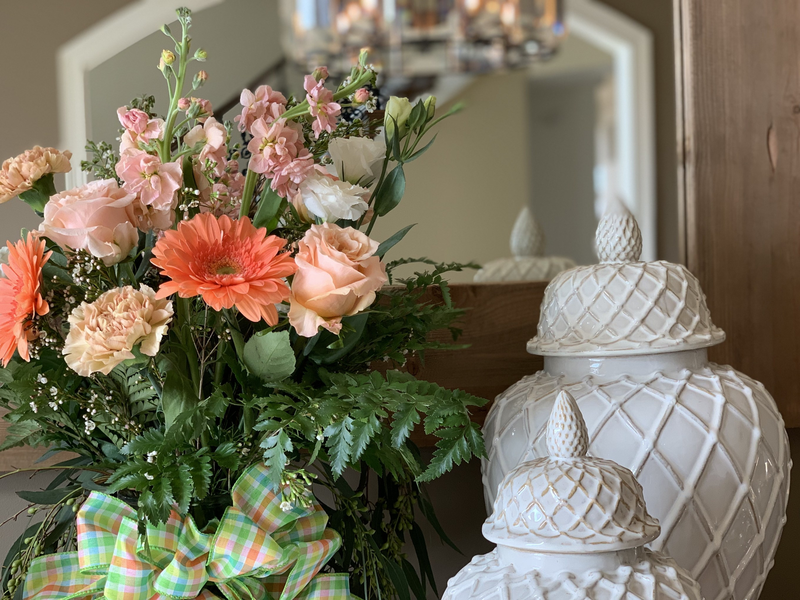 The color combination of this arrangement is very pretty, with soft tones of peach and pink. If you are looking for more Spring Flower inspiration, check out How to Assemble an English Garden Basket and Step by Step Guide to a Spring Floral Arrangement. For more posts about flower ideas, please subscribe to Happy Haute Home and follow along on Pinterest HERE, and Twitter HERE and feel free to pin and tweet your favorite pics from Happy Haute Home. You can also get daily home decor inspiration by following along on Instagram HERE. If you use any of my tips to make a Spring flower arrangement, tag me on Instagram, I would love to see it! Love the roses! And the color tones from the different flowers are amazing! Hi Mel, I just love how these color tones go so well together. So many different varieties of roses out there, Shimmer roses are big and beautiful!